After 3 and half years of eating delicious wings, we decided it was time to crown a champion. 4 of the top Wing-Off winners were picked to battle it out for the top spot. Bar-Coastal defeated Croxley Ale house to make it into the semi-finals. But before we could get to that, 2 other Wing-Off faves had to face each other to determine who Bar-Coastal would face. 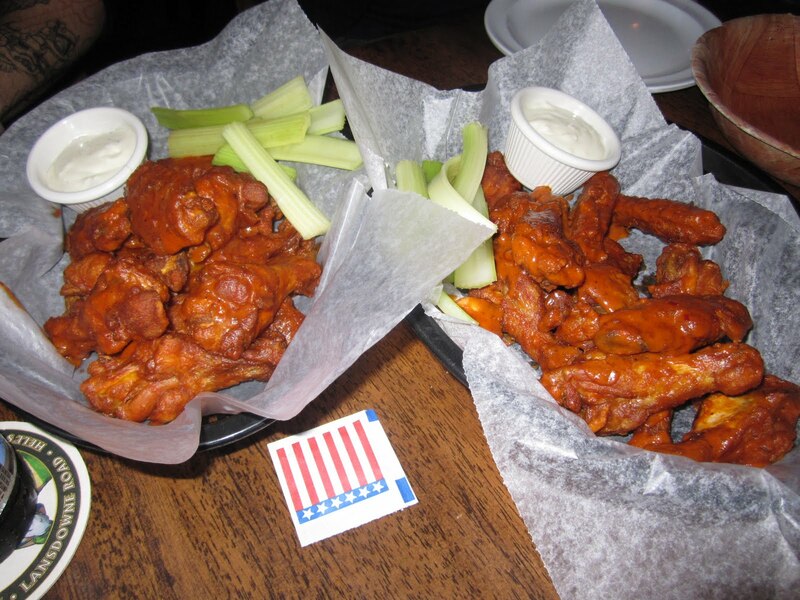 Wogie’s squeaked past the Town Tavern in what was a close victory to win Wing-Off 7. Their Philly style eatery is parked in the West Village and although cheesesteaks are their claim to fame, they make some damn fine wings. As it was a nice spring day, we took a seat outside on the sidewalk and placed our order for Mediums, Hots and also the Wogie’s specialty wing, the Salt and Pepper. With several of us still dusting off cobwebs from Wing-Off 12 and the 12 hour party that followed, only the day before beers were not only in order, they were needed. A few frothy bevs were sucked down before Wogie’s delivered the wings. Oh Wogie’s. How do you do it? How do you make such delicious, hot, crispy wings? The sauce is good and the wings are meaty. The difference in heat between Medium and Hot could’ve been more distinct but regardless, these are great Hot Wings. The Salt and Pepper are really unique and although simple, they are quite delicious. Our server suggested we dip them in the Hot sauce and we tried it, we realized what great advice she had given. Wogie’s, indeed had a very strong showing but they had to face our first champion, Lansdowne Road. 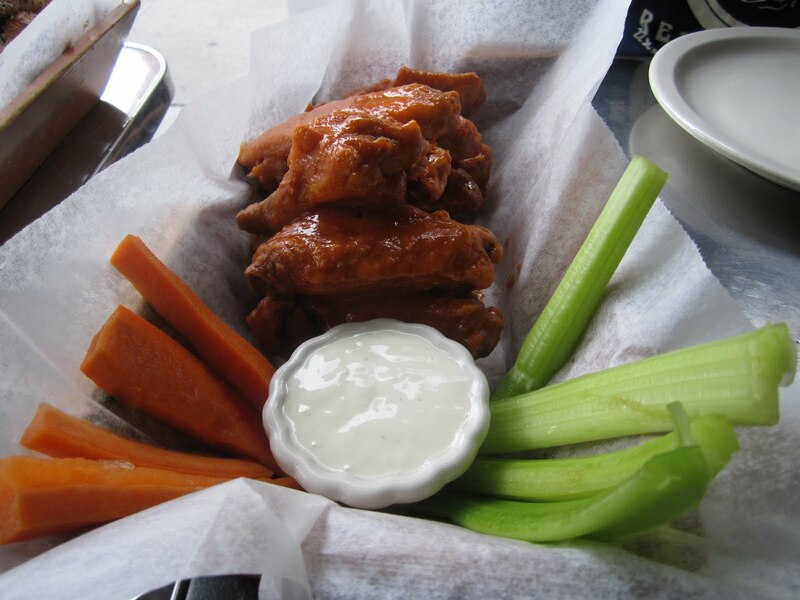 Lansdowne Road serves Scruffy Duffy’s wings and for those that know the story, Scruffy’s are the wings that started the Wing-Off argument. Scruffy’s eventually was forced to close and their sister bar, Lansdowne Road began to serve them. In fact, we even retired Lansdowne Road’s wings after Wing-Off 5, as it seemed they could not be beaten. Today, the title would be challenged. 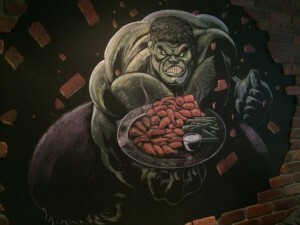 Scruff Duffy’s Wings are no joke son!! They’re the perfect size, cooked just right, crispy on the outside, yet moist under the skin and the flavors, oh the flavors!! 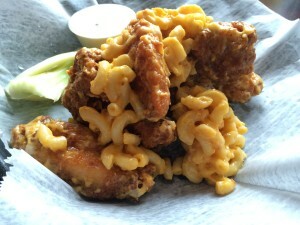 The Scruffy Duffy’s wing sauce is one of the most original out there. No hints of Frank’s Red Hot here, these are made from scratch. The Hots are hot and the Mediums are a true medium. Truth be told, you can not go wrong with the wings at Lansdowne Road. WING-OFF 13 OFFICIAL WINNER – DECLARED A DRAW! Honestly, it was just too close to call. 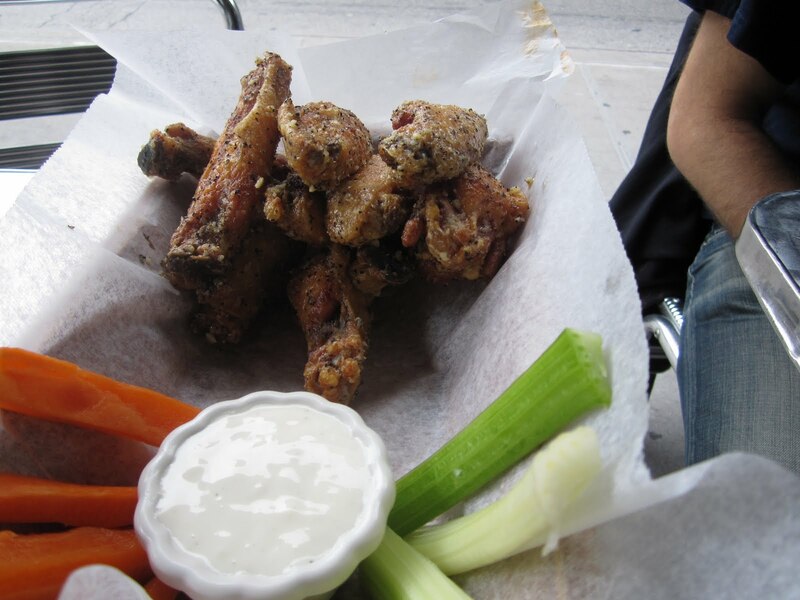 Both Wogie’s and Lansdowne Road make killer wings and truly deserve a chance at the top spot. That means Wing-Off 14 will be Bar-Coastal vs. Wogie’s vs. Lansdowne Road. I hope our stomachs can handle it! DAMN – so sorry I missed lucky #13 but I will be there to judge the finale!! !